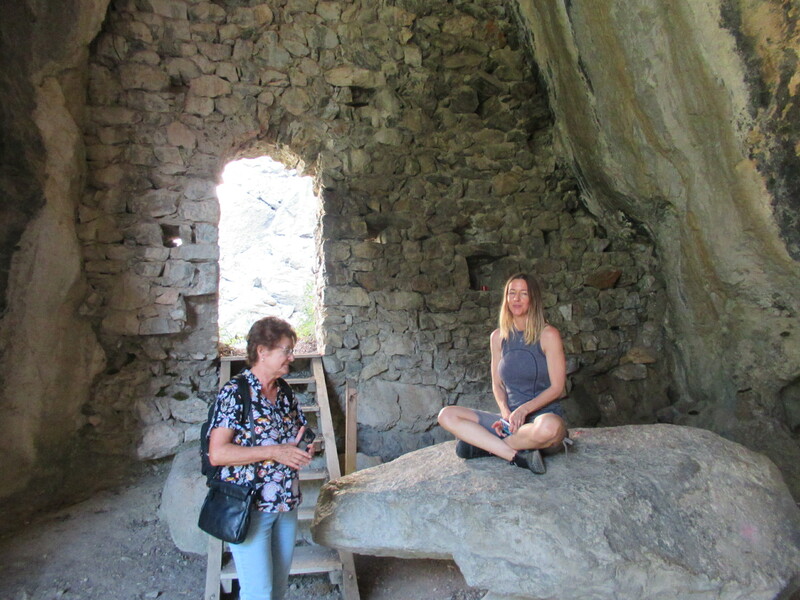 In my exploration of communing with powers within the earth I have found a rich variety of sacred spots in the Southern France, Languedoc region that has expanded my consciousness. To know of a higher vibration is simply stimulated and known by being in the forest or other sacred places there and tuning into them. In a smaller area of The Languedoc is the The Aude River area where there are a variety of places in nature, churches and caves that have special higher vibrations. Each one of the sacred sites there seems to have a different quality to them and as we venture into the energetic vibrations of the sites they will expand or stimulate various chakras. The sites seem to be connected to ley lines and/or energy fissures within the earth and these special vibrations seep upwards to the sacred places. It is as if we are receiving vibrations of another world within this earth, special frequencies from other dimensional realities of the inner earth. The sacred sites seem to have a link to some of the special places. One of the realities that appears to come up from a deep place within the earth is what I call “The White Light Reality”. It is an energy that seems to emanate an invisible higher vibration of white light into the area of the site and the heart and other parts of the body feel these frequencies. As we go to these spaces and place our hands on the altars or sit on a rock where these vibrations come out of; the light will enter us, it seems to fill up our heart or other parts of our body. It is as simple as going to the site, placing our hands on an altar or sitting on a rock and inviting the source to come inside of us. While we meditate or pray in the sacred spot we are taking an internal journey to feel what light will open inside of us. For some it may feel like an expansive light that teaches them a higher vibration or for others it maybe when they feel opened in their heart, a feeling similar to love. Each sacred site has a different quality in its connections but there are some common attributes such as the source of the light seems to come from a deep place within the earth and has a constant flow coming into us once we have invited it in. One of the places that I’ve experienced this light is in the sacred Cathar cave called “Grotte De Bethlehem” near Tarrascon, France. This is a medium-sized cave located deep in the steep hills of the Pyrenees mountains and has a large opening so plenty of sunlight streams in. In the middle of the cave sets an approximately 4 ton rock that is set on three smaller round rocks, making it a crude form of a table. As a person lies on the rock the light comes up into their body. I have spent hours lying on the rock and found that it takes me on a journey as it fills my body up with light and I go into semiconscious states and see past life’s, other realities and generally feel an ecstatic high. When I’ve completed my time in the cave I always feel transformed. Another one of these sacred places of light is in the small town of Vals that has a church built into a mountainside. It is been a sacred place for longer than recorded history and artifacts have been found dating back to 2500 BC. The structure itself is a architectural wonder with the church and natural rock blending together to ascend up the mountain. But the special place within the church is the altar itself and placing one’s hands on the altar seems to activate the white light. Some people say that it is so strong that they feel their hands shaking with the flow of energy coming into them. Like all of the sites they seem to open an energetic opening when people invite the energies in and the more persons there are in the activation the altar seems to magnify the experience more for everyone. Upon the high hills south of Pic De Bugarach sits Château De Payrepertuse, this ancient fortress seems to blend into the Rocky Mountains peak as if it’s a gray Dragon sitting on top overlooking the vast landscape. Within this Fortress are two churches but the one of light is on the lower level of the Château called “Iglese De Marie”. What remains of the church is only a rock structure with part of the roof and the walls with a stone alter intact under the stone eve. Once again when we place our hands on the altar the light activates. One of the most popular sacred sites of this region is called Hermitage De Galamus, it is a beautiful church built into a cave nestled on the cliff walls of Gorge De Galamus overlooking the gorge stream 400 feet below. Most people come because of its beauty while others come because of the history as it was founded by St.Antone in the fourth century however, it is suspected to be an ancient site much older where some say Mary Magdalene likely worshipped. For those who are more sensitive they feel a heart opening experience while in the church/cave. I have visited the Hermitage De Galamus dozens of times and as I first experienced it’s energy it resonates inside of me particularly in my heart chakra area that I interpreted as a strong feminine presence. In time it was perceived as a soft balance between masculine and feminine. Through time I have found that there is a source of pure white light emanating from the back of the cave up in the roof area. My current meditation is to place my intention and focus on this upper area of the cave where no one can climb and as I do the white light enters in a more profound way. It is a wonderful experience just to sit with the light vibrating inside as if it is interacting with the tiniest particles inside of you, our molecules appear to be transforming into a much lighter vibration. To sit in such a lighter atmosphere and allow it to come inside teaches us to vibrate as a light being and trains are mind on what the vibration feels like. Therefore when we depart from the experience we can remember with our mental faculties what our bodies felt like during the meditation. We can recall the memory and activate the light again. Consciousness is much like a training as we practice our awareness will change to align or grow into the lighter vibration. From there we teach ourselves a new form of being that includes changing our brain waves, intelligence, psychic abilities and have a new energy to attract our dreams to us. As we become lighter we become a greater magnet to attract whatever we wish and these special places can give us an immense power to establish it in our lives.